To protect the back of the hand, we have added mail on our black leather gauntlets and also placed slightly cupped steel lames all around the cuff. These gauntlets offer good protection to the hand, wrist and lower arm from a sword slash or draw cut. There's a pair much like these at the Art Institute of Chicago that are highly decorative, however we have left ours plain to keep the price down and to allow them to be historically correct from the Early Middle Ages well into the Renaissance. These mail gauntlets are a must for any enthusiast. Choose from sizes XS, S, M, L and XL.To protect the back of the hand, we have added mail on our black leather gauntlets and also placed slightly cupped steel lames all around the cuff. 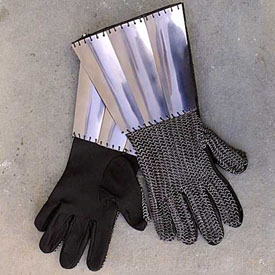 These gauntlets offer good protection to the hand, wrist and lower arm from a sword slash or draw cut. There's a pair much like these at the Art Institute of Chicago that are highly decorative, however we have left ours plain to keep the price down and to allow them to be historically correct from the Early Middle Ages well into the Renaissance. These mail gauntlets are a must for any enthusiast. Choose from sizes XS, S, M, L and XL.